Potato Salad, the always popular side dish, might not be the main course at your next soiree, but if you make it right, it’ll surely be the first thing to go! There are already many different variations of how Cajuns make their authentic potato salad. Most recipes were passed down from mothers and grandmothers and how they prepared it back in the day. There are even MORE hilarious variations by those who put everything in their refrigerator in the dish. I actually saw creamed corn and broccoli in one. GEEZE! Although these recipes probably taste good (maybe), remember there are only a handful of slight variations in how simple Cajun people originally made potato salad. Typically, a Cajun gathering would have a “PLAIN” Potato Salad (for the Kids) and a “CRUNCHY” Potato Salad. These are the two kinds of potato salads back in the day; and in many modern Cajun homes this is still the norm. Additionally, in the old days, there was no such thing as store bought mayonnaise; therefore you had to make your own. I was fortunate enough to have Momma and MawMaw show me how to make home-made mayo. In those days, we only had fresh eggs from the barn and boy did those taste awesome! My recipe for making Ole Fashion Cajun Mayo will be coming in a future recipe post soon. 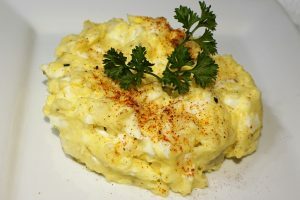 An authentic Cajun potato salad can vary from the type of potato you use (Golden, White or Red potato), it can vary if it’s smashed or chunky, what type of seasoning you use and it also varies whether you would make it PLAIN OR CRUNCHY. I’ve written about each variation below; so you decide which way is best for you. Remember, back in the day, everyone was poor; therefore they did not have all this fancy stuff we have today to add to their potato salads. Heck! They didn’t even have paprika to garnish it! I remember growing up making potato salad sandwiches with fresh Evangeline Maid bread. I bet that brings up some fond memories in my fellow Cajuns. There is one thing for sure; Cajun Potato Salad is not purchased in a store unless you have a little ole lady in the deli making it fresh for you. Remember potato salad is not served cold but rather served at room temperature. It must be made an hour or two before you serve it. The most common Cajun foods that accompany a Cajun Potato Salad are all types of gumbos, crawfish etouffee, and BBQ. Cajuns love starches, with starch on starch dishes. It’s debatable on which potato is best for a Cajun Potato Salad. The answer is to use what you prefer. Although each potato will give you a different taste, the Gold Potato will taste creamer, and the red potato will have a different consistency than the white potato. So you pick, either way, you can’t go wrong with this PLAIN basic Cajun Potato Salad. Some Cajun Potato Salads are made with the potatoes mushed down all the way (same consistency as cream potatoes) while others are lumpy (chunks of potatoes remain), but ALL Cajun Potato Salads are very moist and creamy. It’s pretty simple; you decide how much to smash the potatoes; there is no right or wrong way! Back in the day, a Plain or Crunchy Cajun Potato Salad was made with only salt and black pepper. Today, we use different Cajun Seasonings on the market and even use crab boil or a dry seafood boiling mix seasoning such as Zatarains. These are all fabulous options. In the old days, MawMaw added diced up RAW onions, celery, and bell pepper to the recipe listed below; this melody of vegetables is commonly called the Holy Trinity. You can also saute the holy trinity in button until the vegetables are transparent. This takes away the crunchiness. (Not part of the authentic Cajun Potato Salad). Peel and cut your potatoes into fourths, then boil the potatoes and the eggs together. The recipe calls for red potatoes, however, I prefer Yukon gold potatoes. After the water has been boiling for 10 minutes, remove the hard-boiled eggs and continue boiling the potatoes until they are almost falling apart. Strain the water and let the potatoes begin to cool off a little. Peel the boiled eggs and slice them in half. Put the whites in one bowl and the yolks in another bowl. Preparing the Egg Whites: With only hard boiled egg whites in one bowl, chop up the egg whites into small pieces Leave the egg whites in the bowl until you are ready to mix it with the potatoes. Preparing the Egg Yolks: With only hard boiled egg yolks in one bowl, crush them down with a fork until they are totally crumbled up. Mix the Blue Plate Mayonaisse with the egg mixture. Note… If you choose to make the potato salad with another Mayo besides Blue Plate, you will not get the full taste of a real Cajun Potato Salad. Add the mustard and continue mixing together. OVER SEASON using Salt and Black Pepper. HINT… Then add a lot more black pepper. The black pepper taste just gets into the mixture and has a welcoming taste once mixed with the potatoes. Don’t worry, it won’t taste peppered once you mix it with the potatoes. Mixing Everything Together: Note that a number of potatoes are bound to be a bit different each time you make the potato salad due to the size of the potatoes. Don’t worry, I will get you through this. With the potatoes still warm use a potato masher and mash the potatoes. Note.. If you prefer your potato salad lumpy instead of creamy, just don’t smash the potatoes as much. You decide on how much you like to smash your potatoes. Add the chopped up egg whites to the potatoes and stir well. Then add the egg mixture and stir well. If you choose to add the dill relish, mix it in now and stir well. Now there are two things that you will need to focus on at this point.1- Is the mixture stiff or is it creamy? If it is stiff, add more mayo; however if it is creamy, then you nailed it. 2- Taste it to make sure it is seasoned enough. Check for salt first; add more if you need. Then the second thing is to determine if you have enough black pepper. Do you see it in the mixture? If you don’t see it, add more! HINT.. Cajun Potato Salad is ALWAYS served warm to room temperature. Always make your Cajun Potato Salad moist and creamy. Stir well and add more mayo if you have not achieved the desired creaminess. Always remember, you never can put too many eggs; so when in doubt, add another egg or two.